Arts - Limoges Boxes and Figurines - Limoges Factory Co. The Limoges boxes that depict the paraphernalia of drawing, painting and photography are included in our special collection called art boxes. They are a set of Limoges boxes which serve as great décor items in your living room or office. The easels with magnificent paintings mounted on tripods are very artistic creations. 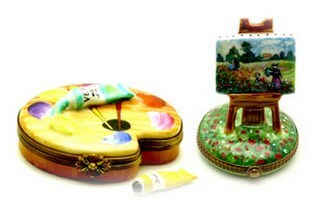 Most of these porcelain boxes come with complete sets of painting equipments like pallets, paint tubes etc. These comprehensive painting kits make them special as collectibles.